Full sun in very warm locations only. No. 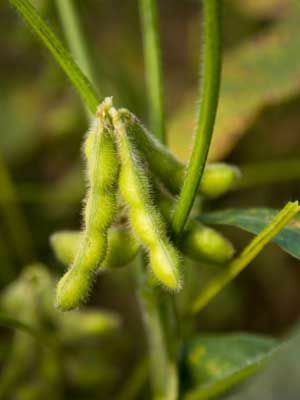 Soya beans are a warm-season crop to grow in summer in hot climates. When using soya beans to improve very poor soil, mixing a balanced organic fertiliser into the soil before planting will give better results. Marigold, Sweetcorn, Squash, Celery, Strawberry and Potatoes. Plant seeds from late spring to early summer. Soya beans must have warm soil to germinate and grow. Poke holes into a cultivated bed or row to plant soybean seeds about 5 cm (2in) apart and 1 cm (1/2in) deep. Thin to 15 cm (6in) apart in all directions. Soya bean green manures are used primarily to add nitrogen to poor soil. Chop down or pull up plants just as they begin to flower. Nitrogen nodules left behind in the soil add fertility. Soya beans are very attractive to deer.